Many are the markets in Ipswich. There's the market itself, a selection of stalls that's had various homes (Crown Street prior to the pool, then outside Civic Centre) and is now conveniently located dead centre in front of the town hall. There's the Cattle Market, home to the red buses opposite Pal's (known to some as the meat market). Very close to that you'll find the Buttermarket, both the name of a street and a sprawling indoor shopping centre. Until they went belly up in 2005, the Buttermarket bedrock was Allders department store. Eventually that space was filled by the twin Ts of TJ Hughes and TK Maxx. 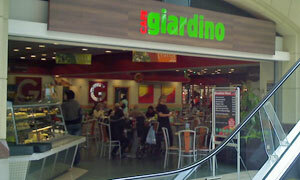 About that time, the toy shop on the corner gave way to an open plan eatery, Cafe Giardino. Despite sounding like a player from the 1974 Brazilian squad, this is a chain stretching from wonderful Basildon to beautiful Woking. Naturally good is their tagline: we'll see about that. I'm second (equals last) to arrive and Andy's well underway at one of the multitude of free tables. Right, I say, I'll order and join you in a min. It's a long min, maybe because the food is freshly assembled and maybe because they're understaffed. Queue time brings to mind our outing to the M&S Cafe. Will the food -- chicken & bacon baguette -- be as good as there? Answer: no. Nowt wrong but you wouldn't pen a postcard about it either. Like a three year old Mondeo on a dashed white line, it's serviceable and middle of the road. Though I did like the unusual San Benedetto peach ice tea. Atmosphere is neither one thing nor another, reflecting the non-result that's emerged overnight from yesterday's election. We're all Tory now. You'd need to be fiddling your expenses to find £1.75 for a jam doughnut. With Andy jetting off, I'm tempted to go into the nearly adjacent Starbucks for a flat white. Instead, I stay for an underwhelming coffee and an OK-ish toasted teacake (fetch your own knife and butter). You'd be reasonably pleased with such a cafe on the M4. I'll say no more. If it was a car -- Skoda Roomster. If they were passing by -- Mark Dyson.